Heat the oil in a 12-inch skillet over medium heat. Add the garlic and onion and cook until tender, stirring occasionally. Add the spinach and cook for 5 minutes or until wilted. Remove the spinach mixture from the heat and let cool to room temperature. Drain the spinach mixture well in a colander, pressing to squeeze out any excess liquid. Return the spinach mixture to the skillet. Stir in the cheese and lemon juice. Sprinkle the work surface with the flour. Unfold 1 pastry sheet on the work surface. Roll the pastry sheet into a 12-inch square. Cut into 16 (3-inch) squares. Repeat with the remaining pastry sheet. Brush edges of the squares with the egg mixture. 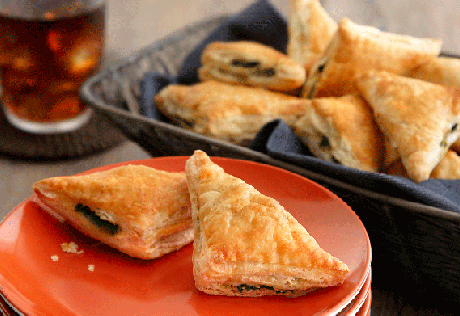 Place about 2 teaspoons spinach mixture in the center of each pastry square. Fold the pastry over the filling to form triangles. Press the edges to seal. Crimp the edges with a fork. Place the filled pastries onto 2 baking sheets. Brush the pastries with the egg mixture. Bake for 20 minutes or until the pastries are golden brown. Remove the pastries from the baking sheet and let cool on wire racks for 10 minutes. Recipe Note: You can line the baking sheets with parchment paper to help keep the pastries from sticking. It also makes for easier cleanup. If you don't have parchment paper, you can spray the baking sheets with cooking spray instead. However, cooking spray may cause the bottoms of the pastries to brown more quickly, so begin checking for doneness 5 minutes early.